Yesterday we talked broadly about retiring Baby Boomers and the big picture outlook for Oregon employment. Today we will focus on the number of retirees based on our office’s economic and demographic forecasts. Oregonians are working later in life to a larger degree today than at any point in recent memory. In fact if you compare employment and retirement patterns in Oregon today with the late 1990s, this shift is equal to roughly 2 years. That means Oregonians are retiring approximately 2 years later today than 15 years ago. That may or may not sound like a lot to you but it certainly impacts the labor market and it means there are about 1,000 fewer retirees each year (or 5% fewer) than just a few years ago. That calculation, of course, adjusts for demographics and takes into account that the retirement and near-retirement age population is larger today. In the past our office has highlighted the fact that Oregonians, and Americans, are working later for both good and bad reasons. Along these lines I wanted to highlight some work that ECONorthwest’s Dr. Kevin Cahill has done in recent years (see here, e.g.) Among the topics he discusses are the number of pro-work changes that have happened in the past generation or so. Some, like the increased social security retirement age, lower savings and private pensions moving to defined contribution, mean older Americans are more exposed to macroeconomic fluctuations than previous generations and as a result need to work later in life. Others, like higher levels of educational attainment, improved health and less physically demanding jobs, allow individuals to work later in life if they choose to. While such changes impact individuals and their want or need to work, employers also face challenges and opportunities with older workers too. UPDATE: In the comments Bill mentions health care costs as a big impact too, which is a great point and true! Just as when we discuss our Peak Renter work, there is a clear distinction between life cycle changes and generational changes. As noted above the generational change for retirements has been about 2 years. However the life cycle trends remain quite strong. 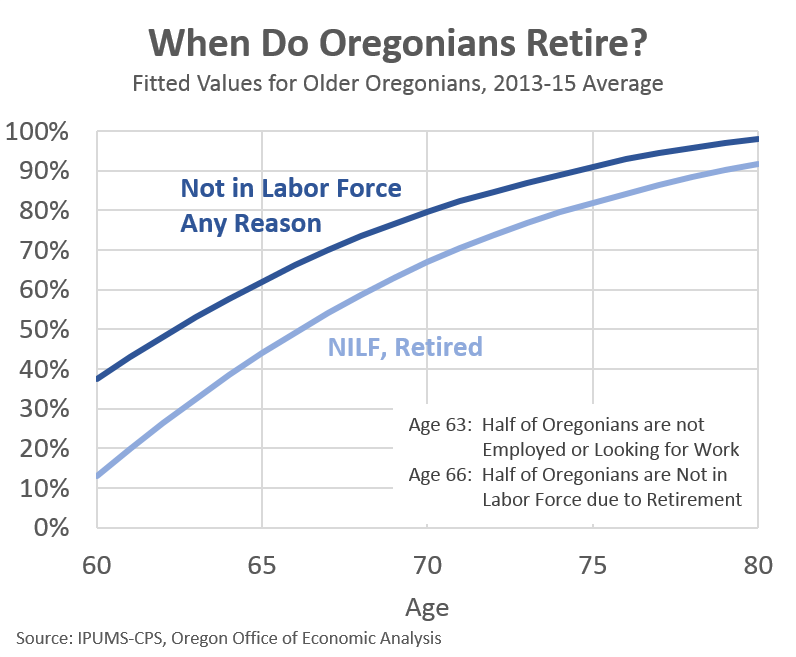 As Oregonians age into their late 60s and early 70s the vast majority of them are not in the labor force (not employed and not looking for work) and a rising share are also not in the labor force specifically because they are retired. The relatively smaller difference between the lines are the older Oregonians saying they are not looking for work because they are ill or disabled, or staying home to take care of the kids (likely grandchildren). Using the above life cycle curve and applying it to our office’s population and demographic forecast gives a projection of the number of Oregonians retiring over the next decade. 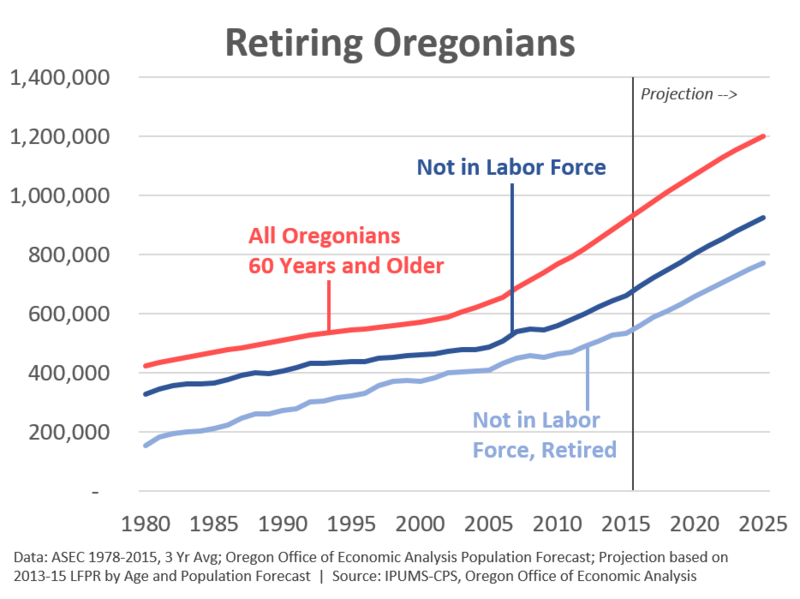 Given the large Baby Boomer generation is now partially into their retirement years, there is no real surprise that the number of retiring Oregonians is increasing and expected to continue to do so over the next decade. What is more interesting, however, is comparing the coming decade with the recent past. The number of Oregonians entering their traditionally-defined retirement or near-retirement years is expected to be essentially the same. 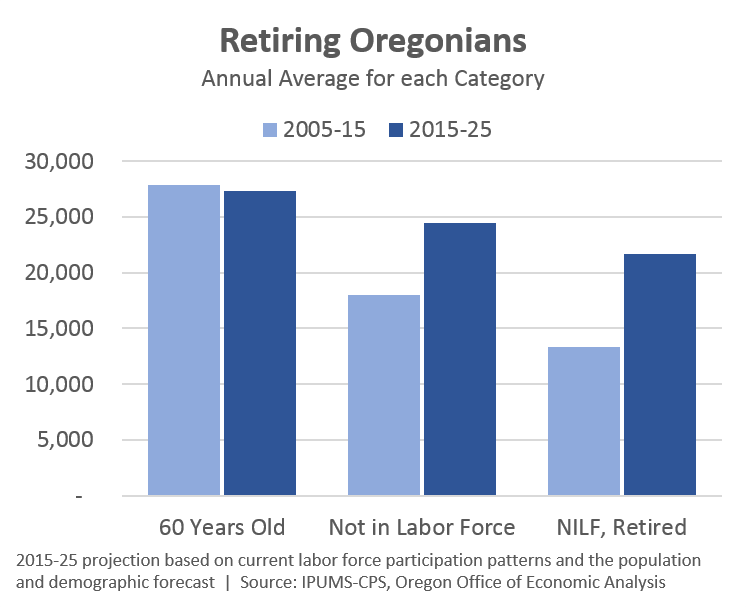 However given demographics and the age structure of the population, the number of Oregonians who will drop out of the labor force and retire is expected to increase considerably. This change represents an increase of 6-7,000 more retirements each year relative to what was seen in the previous decade. In terms of the outlook, this increase in Oregonians not in the labor force and those officially retired will provide more job opportunities for younger workers as discussed yesterday. If you reverse engineer the job growth calculations in our office’s forecast but add back in the retirees, statewide employment would increase 35-40% more that our forecast indicates. While that would not return job growth in the state to the stronger numbers seen historically, it would boost net growth rates higher. The difference represents the generational churn in the labor market that is taking place today and expected to continue to do so in the coming decade (or two). Finally, it should be pointed out that the aging population will have different impacts over the next 10-15 years than it will 20-30 years out. That far out, we are talking about Baby Boomers entering into their later years when end-of-life care and related medical expenses will increase considerably. It is also a time when some move back closer to family and urban areas with more-plentiful and more-advanced medical care facilities. However, in the coming decade or two, the increasing number of older Oregonians will be in their so-called active retirement years. Such individuals will be more involved in their communities, with their families, they will travel more and so forth. As the saying goes, 70 is the new 50. This generational transition will provide a number of opportunities for regional economies to capitalize on the growing, active population that, generally speaking, has time and at least some disposable income. « Will There Be Enough Jobs? In your description of the factors that are influencing people to work longer you left out perhaps the most important one, which is the increasingly daunting cost of providing their own health insurance. That line item now looms very large in people’s retirement planning. Thanks Bill; obviously health care is a huge deal. Oversight on my part there! Updating shortly.